1.Prepare Lamb: Position oven rack to 5 inches from source of heat; preheat broiler. Place rack in large roasting pan; place lamb on rack. Rub all sides of lamb with oil; evenly sprinkle with salt and pepper. Broil lamb 4 to 5 minutes or until top is browned; turn lamb and broil 4 to 5 minutes longer or until top is browned. Remove lamb from oven. 2.Preheat oven to 325°; position oven rack to middle position. Turn lamb; rub top with garlic and parsley. Loosely tent lamb with aluminum foil; roast lamb 1 hour 15 minutes or until internal temperature reaches 135° for medium-rare. Transfer lamb to cutting board; cover loosely with aluminum foil and let stand 15 minutes before slicing (internal temperature will rise to 145° upon standing). 3.Meanwhile, prepare Mint Gremolata: In small bowl, stir together all ingredients. Makes about 1/2 cup. 4.Slice lamb and serve with gremolata. For faster, more even cooking, let lamb stand at room temperature 1 hour before preparing. Broiling the lamb prior to roasting creates a nice, golden brown sear on the outside. 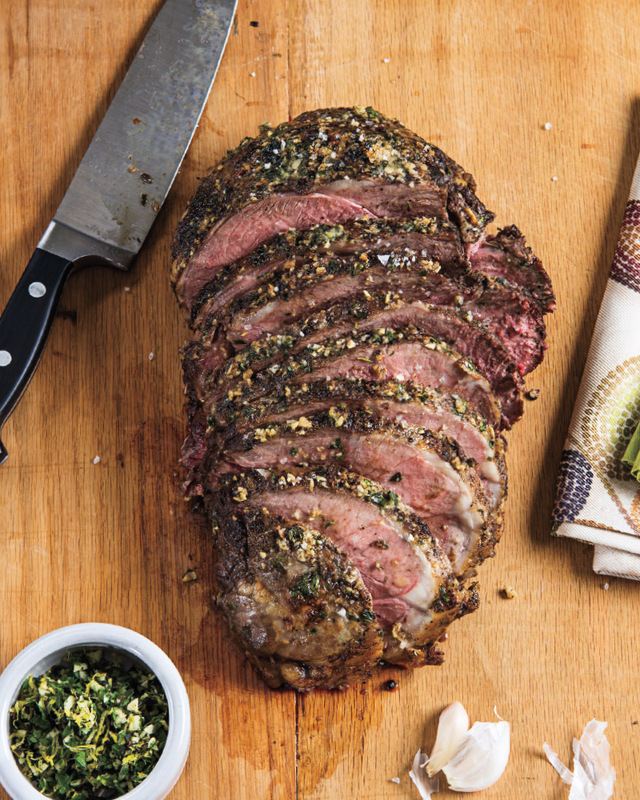 > A leg of lamb is a naturally tender cut of meat that doesn’t need any marinade. In fact, marinating this cut could actually make it tough. Stick with a simple seasoning like in the recipe. Once cooked to your desired doneness, let rest and always cut against the grain to get the most tender slices.